Things kicked off early this week from Nike, which is followed by some notable releases from Jordan Brand, Under Armour and adidas. Thursday was probably the largest launch day of the week, which included the new fragment x NikeLab Air Max LD-Zero, the Supreme x Nike SB Blazer GT and the debut of the Jordan Future Boot. 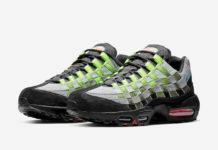 For Friday, Dave White’s Nike Air Max 95 releases debuted in two colorways inspired by his “Albion Series” of art. On Saturday, Under Armour is releasing a “Miami” colorway of the Curry 2.5. Jordan Brand debuts the “Bronze” Air Jordan 5 and Nike will be debuting a brand new Kyrie 2 and Kobe 11. But the biggest release of the weekend is from adidas and the debut of the Yeezy Boost 350 V2 “Beluga” colorway.